Minister of Antiquities Khaled El-Enany inaugurated on Saturday the tomb of the sixth Dynasty Vizier Mehu in Saqqara Necropolis, Giza, almost 80 years after its discovery in 1939 by an Egyptian mission led by Egyptologist Zaki Saad. “The tomb is one of the most beautiful in the Saqqara Necropolis because it still keeps its vivid colours and distinguished scenes,” said El-Enany, adding that among the most peculiar scenes in the tomb is one depicting the marriage of crocodiles in the presence of a turtle. Among the most important scenes shown on the walls are those featuring the owner of the tomb while hunting in the jungle or fishing, as well as those showing scenes of good harvests, cooking and acrobatic dancing – all of which has not been previously found in other discoveries in Saqqara before the sixth Dynasty. 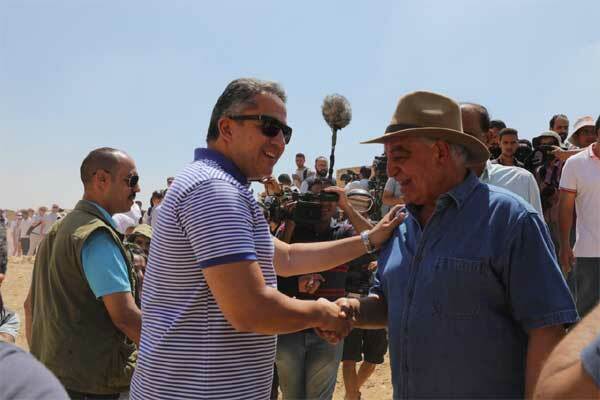 Minister of Immigration and Egyptian Expatriate's Affairs Nabila Makram and renowned Egyptologist and former Minister of Antiquities Zahi Hawass, along with 12 ambassdors to Cairo, including the European Union, Brazilian, French and Belgian, attended the opening. Hawwas said that he is very happy to witness such an opening as he studied the lintel and witnessed the tomb’s restoration. Mostafa Waziri, the secretary general of the Supreme Council of Antiquities, explains that the ministry is undertaking restoration work on the different scenes of the tomb by consolidating paintings, strengthening colours and developing the lighting system inside. Sabri Farag, the director-general of the Saqqara archaeological site, pointed out that the tomb does not only belong to Mehu himself but members of his family as well. Mehu lived during the reign of King Pepsi I and he held 48 names and titles inscribed on the wall of his burial chambers, as well as his sarcophagus. Among these titles are the scribe of the royal documents, the vizier and head of the juries. The tomb is six meters to the south of the southern wall of Djoser’s pyramid complex, and consists of burial chambers for his son Mery Re Ankh and grand-son Hetep Ka II. 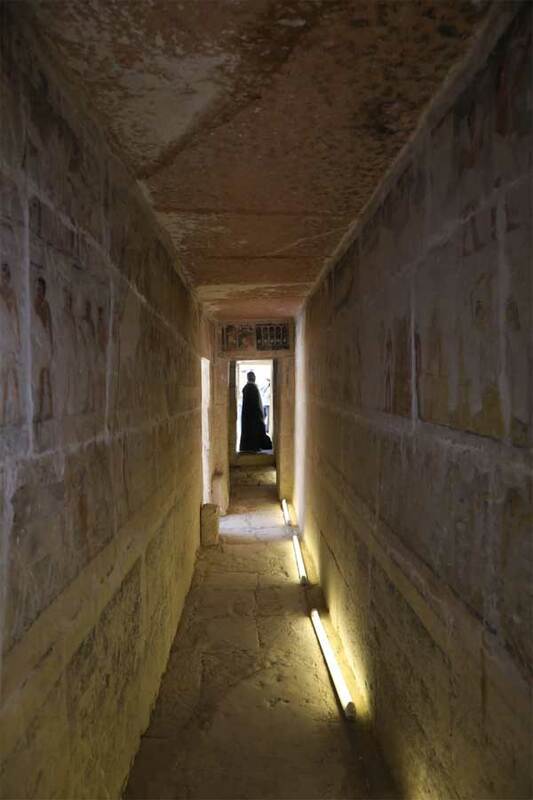 It has a long narrow corridor with six chambers. Inside Mehu’s burial chamber, a sarcophagus with a lid was uncovered. Mery Re Ankh had 23 titles carved and inscribed on the walls of his burial chamber. He was the overseer of Buttu region. Meanwhile, Muni’ s grand son lived during the reign of king Pepsi II and painted his false door inside the pillars hall of Mehu. He held 10 titles among them, the holder of the Director of the palace. After the Mehu’s tomb opening, El-Enany along with a group of foreign ambassadors to Egypt, including the Brazilian, Belgium and French envoys, embarked on an tour to inspect the latest work carried out at the southern tomb of King Djoser’s in Saqqara. 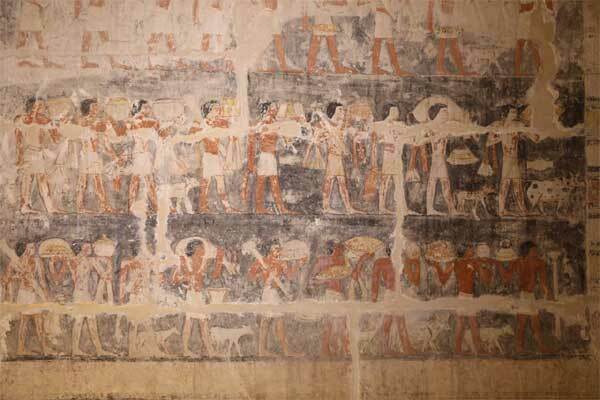 The tomb is expected to open after the completion of the king’s funerary pyramid complex. The minister pointed out that the southern tomb is one of the most important structures of the king Djoser’s funerary complex. It was discovered in 1928 and it is located in the south- western side of the funerary complex. Waziri explains that the conservation works carried out inside the tomb included the consolidations of the faience tiles that once decorated the inner arches of the tombs well as the floors, walls and ceiling. Farag explained that the tomb has an entrance from the southern side leading to a sloping staircase towards a 28 meter deep shaft where a small granite burial chamber is found beneath. 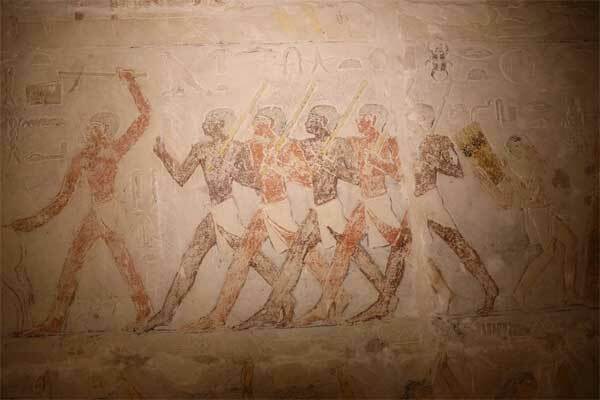 The chamber is 1.6 metres long with corridors whose walls are decorated with scenes depicting king Djoser’s in the Hebset ritual. The king was featured twice: one time while wearing the white crown, and the second with the red crown symbolizing that he is the king of the north and south. He pointed out that the function of this tomb has perplexed Egyptologists as some suggested that it is a symbolic tomb for King Djoser as the King of Upper Egypt, while others see that it is a place to preserve the king’s Canopic jars. A third group believe that it could be the beginning of the construction of side pyramids of other predecessor Kings. El-Anany also visited Tie’s tomb in Saqqara, which is now under restoration. The minister said that conservation work carried out at Tie’s tomb would be completed within days and is scheduled to be open soon. Tie was the supervisor of the Fifth Dynasty royals’ pyramids. Though he was not a vizier, he was still able to construct a large tomb in Saqqara Necropolis. The tomb was discovered by French archaeologist August Mariette in 1865. It is also considered as one of the most beautiful tombs in Saqqara. It is well-known for its coloured inscriptions and reliefs depicting scenes of baking bread and brewing beer. 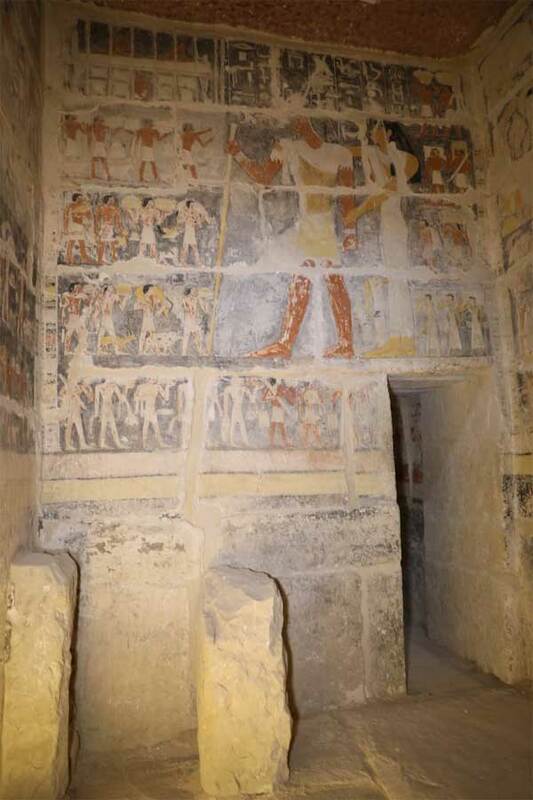 Waziri pointed out that since its discovery the tomb, no restoration work has been carried out there until recently when an Egyptian-Czech mission in collaboration with Saqqara conservators team started the cleaning and conservation work for its walls. This process meant to remove dust and strength the colours of scenes depicted. Conservation work carried out at Tie’s tomb at the Saqqara Necropolis is scheduled to be open soon. Tie was the supervisor of the 5th Dynasty royals’ pyramids, and although he was not a vizier he was able to construct himself a large tomb in the Saqqara Necropolis.